This paper is intended as a guide on how to surf Les Fleurs de l’Orient website and search for genealogical data. 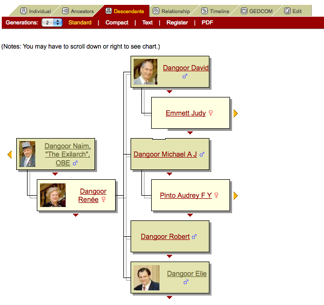 Les Fleurs de l’Orient began as the genealogical homepage of the Farhi families. Its origin was four handwritten pages created by the writer’s grandfather in the 1930s; but it has since then has expanded to include many linked families from Europe, the Middle East and Asia – each with its own ancestors and descendants in its country of adoption. The majority of these families are Sephardim; but Ashkenazim and Karaites are also included, together with some Christians and Muslims. No attempt has been made to publish the genealogy of every family in a particular country – but only those who can establish a link with a person or family already present on the website. Consequently attempts to find a direct relationship between two distant people on the website may not be successful as such relationships may be by marriage and not by blood lineage. A large number of names are of Iraqi origin. This material may interest readers of “The Scribe” as genealogists who researched, corrected and updated family data now posted on Les Fleurs de l’Orient often used past editions of that publication. 2) The author’s wife, Jeannine Toueg whose grandfather was born in Baghdad as well. When opening the Les Fleurs de l’Orient website, you will first be presented with its Home Page. 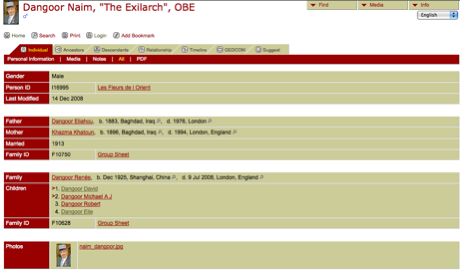 This has seven ‘Tabs’ – Home, Genealogy, Farhi, etc. – displayed in a horizontal line across the top. The site is best viewed with a Firefox browser. Click on a Tab at the top of the page to change the center screen. The left column will then change too, giving subsidiary choices and selections. The remainder of the page is divided into three columns (or ‘frames’ as they are known in the language of websites). The left frame contains the menus and links for pages displayed in the center frame. The main central frame of the Home Page contains a brief description of the website including a Site Map, providing direct links to most of the relevant pages: use this and a new page will open in the maximum size allowed by the browser. • The webpage of the DNA study conducted in 2004 into the common ancestry of several members of Les Fleurs. • The list of the trees (18 separate trees) included on the website. To expand and zoom into the center column, position the mouse over its middle and right-click on the mouse. From the pop menu, select “Frame”, then either “View in New Window or Tab” or “Show Only This Frame”. The frame will open in a new page in the maximum size allowed by the browser. Certain browsers may display slightly different submenus. Internet Explorer does not have that option. The easiest way to find Surnames or locate a particular individual is to use one of the Search Engines listed under ‘Home’ in the left Frame. When selecting the Genealogy Tab, a new menu will appear in the left frame facilitating access to additional resources. Surnames List. By clicking on this Button, you will be presented with a list of names for all persons contained in the main Fleurs tree only. Pick first a family name and then a first name. If the first name does not appear on the page, click on Next and you will be presented with another page and so on. Once you find his/her first name and click on it, you will be transported to a family group page containing the person selected. Click on a person name to see his or her personal data (living persons excluded). 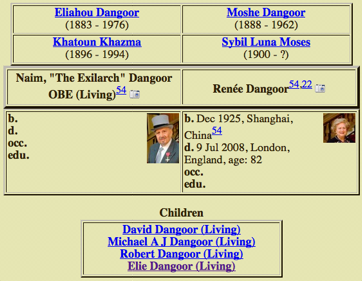 As an example see below the card for Naim Dangoor. Navigate up and down the tree by clicking on any underlined names. The Advanced Search button under the Home tab will allow you to search the databases in a more precise way. Once the name and particular are entered in the form, a short list Index will be displayed Select a person to access his/her personal card. See below a sample card for Naim Dangoor. By clicking on the small tabs, the central display can be modified to show the individual’s information in different formats. Relationship: By Clicking on Relationship, you will find out the relationship between two individuals. You will see the following screen. Find the ID number by clicking on the buttons FIND, then click on Calculate. You can view these Databases in French, Greek, Spanish, Italian, Portuguese and German. Select the Language of your choice by using the drop menu on the right. Look for what has been added recently. Click on the link of the monthly updates . You can see a listing of the cards that have been accessed recently. Unfortunately the list also includes the name of the robots and crawlers that index the site for the major search engine companies (Google, Yahoo, etc). On an individual’s card, you may see superscripted numbers. These are links to the submitter or originator of the data. The list of all these entries can be found at the page – sources. 1. Go to the person whose data needs to be corrected and click on ‘Suggest’ and fill in the data in the screen that will open. 2. Send the changes to be recorded in an email to the Webmaster of Les Fleurs. 3. Download a data form, fill it in and send it back by email to the Webmaster. Forms supplied are in French, English and Spanish. If you wish to add photos to the web cards of the persons in your family, please send small portraits in jpeg format to the Webmaster. Pictures of women should be labeled with their maiden names. The trees are updated at the end of each month, so changes submitted prior to the cut off date will not appear until the following month. • News about the site and the selected persons. • History of a few Farhis. • Events: This lists reunions & photos of Farhi dinners held in Paris. 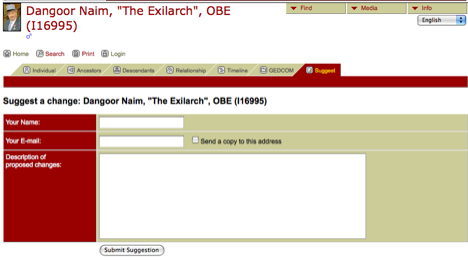 • Contents: Clicking on this button will generate a new list of documents and links to pages about the Farhi. • Slide Show: This page shows a series of pictures of the writer’s immediate family as well as those of a few of the genealogists who helped to create the site. • Other: This page will display calligraphy created by using the name Farhi in Arabic and Hebrew. A Farhi tugra (Ceremonial signature of the Ottoman Sultans) is also shown. • Personal Articles. A list of document written by people mentioned on the site or relevant to their origins. • Dictionary. A collection of idioms, stories and words spoken by French-educated inhabitants of the Middle East. • Links. 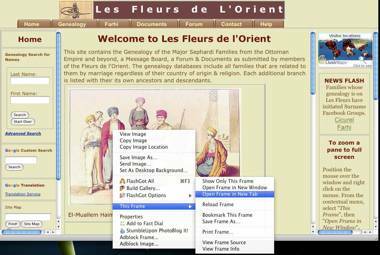 This page contains a list of the websites dealing with the genealogy, persons and families mentioned in Les Fleurs de l’Orient as well as many others. • Bibliography. A list of books, articles or references used in Les Fleurs de l’Orient. • Legal Notice. This outlines the rules used for creating the website and includes the obligation to remove references to those persons who ask for their removal. • References. A list of sources and submitters of the data shown on the trees. Once this Tab is selected, access to the Forum and Message Board will be offered by selecting a button on the left side. Posting on the Message board does not require any log in procedure. Click on Post Entry to compose a message. Click on View to read what has already been written. To participate in the Forum, you are required to register and will have access once your registration has been approved. Log-in is required to prevent spam postings. Clicking on the Blog button will display the Webmaster blog for possible interactive participation. Clicking on the Contact Tab in the central frame will display different methods of contacting the Webmaster. The best way is by email to <webmaster@farhi.org>. Clicking on the Help Tab will display two buttons to assist a visitor to surf the site. It will also display answers to a few of the more frequently questions asked about its operation. The Fleurs de l’Orient website would not exist but for the dedicated work of many genealogists and fa mily members who submitted their data for publication on the Internet. This has enabled many people who ‘Google’ themselves to discover, with a single click, their roots and relatives. We hope that your interest in history of your family and its heritage will continue; and we at Les Fleurs de l’Orient shall look forward to receiving further comments, suggestions, documents, photos and additions from you. The author thanks Lucien Gubbay, Leanne Minny, Ronny Schaul, Helen Bekor and Steven Byars for their comments, suggestions and help in the preparation of this paper. 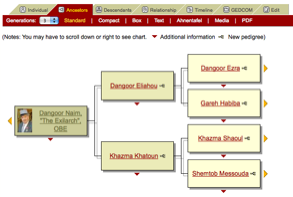 This entry was posted in Comment, Community and tagged Ancestory, Family Tree, Farhi, genealogy, Iraq, Les Fleurs de l'Orient. Bookmark the permalink.